News all over say that there seems to be a serious software developer shortage now. 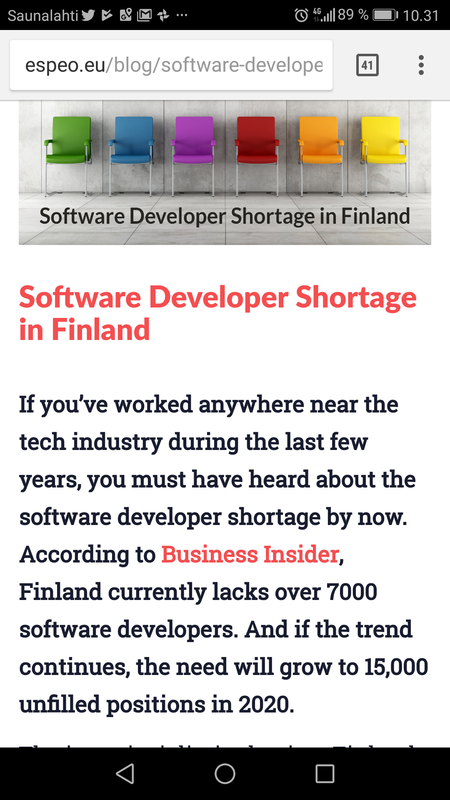 According to Business Insider, Finland currently lacks over 7000 software developers. And if the trend continues, the need will grow to 15,000 unfilled positions in 2020. The issue isn’t limited to just Finland. Other Nordic countries have the same problem. Software engineers have been at the top of the hardest to fill jobs in the United States also. Software Developer Shortage in Finland article shows a few reasons to why this is happening in Finland. 2018′s Software Engineering Talent Shortage— It’s quality, not just quantity article takes a look at the situation in USA. The software and IT services sector will continue to grow, but the labor shortage will weaken the outlook. Over the past few years, software and IT services have been boosted by Supercell, which slams over EUR 2 billion in revenue annually. According to the researcher, the very growth in the gaming industry seems to have flattened. - It would seem that the gaming industry is lagging behind, but there are growth in other product companies and other software companies. Research has shown that companies of all sizes are growing, “says researcher Eetu Luoma from the University of Jyväskylä. , the aggregate net sales of the industry rose to almost 12 billion euros last year. A rise of 6% compared to 2015. Growth is, for example, covered by the availability of funding and digitalisation projects of companies. However, the future growth in the software sector is hampered by the increasingly fragile expertise. According to the survey conducted by the Software Entrepreneurs Association and the Finnish Technology Industries Federation, up to 8,000 skilled people will be affected by this phenomenon. - In practice, many companies have to say no to customers. Businesses are unable to take the projects they offer. Businesses are aiming at a strong growth of 30%, these readings can not be reached. Roiha estimates that the skills shortage will grow to a couple of thousand when digitalisation projects are advancing in traditional industries such as construction. - There should be more study places.